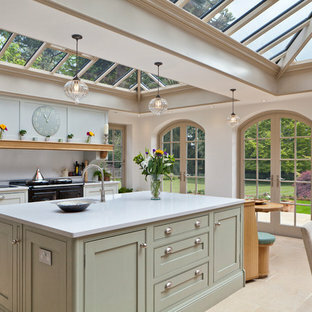 Stunning kitchen/diner with twin rooflights and arched doors leading to a terrace area and the gardens beyond. 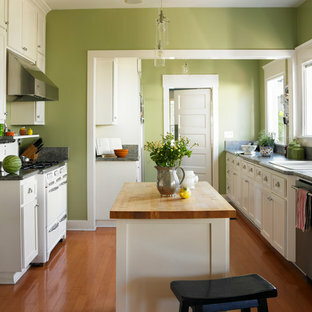 Photo of a large traditional eat-in kitchen in Other with beaded inset cabinets, green cabinets, black appliances and an island. 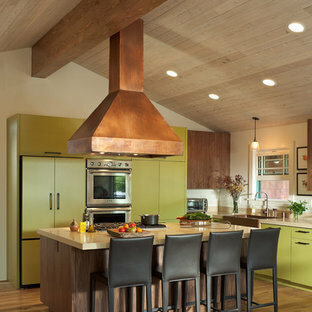 Inspiration for a contemporary l-shaped kitchen in San Francisco with a farmhouse sink, flat-panel cabinets, green cabinets, stainless steel appliances, medium hardwood floors and an island. Architect Neal Huston designed this smaller floor plan which accommodates the owner’s lifestyle. A large living/kitchen/dining area with large windows and door opening to the private patio are perfect for entertaining. Two master suites at opposite ends of the house plus a “Casita” for extended-stay guests. The inviting detached Casita has a comfortable seating area, bathroom with a clawfoot tub/shower, and bedroom. Transitional kitchen in West Midlands with a double-bowl sink, glass-front cabinets, dark wood cabinets, white splashback, marble splashback, stainless steel appliances, light hardwood floors, an island and beige floor. 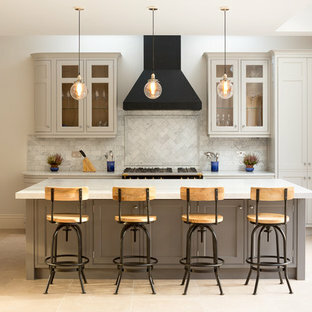 Design ideas for a large transitional l-shaped eat-in kitchen in London with shaker cabinets, grey cabinets, an island, ceramic splashback and porcelain floors. 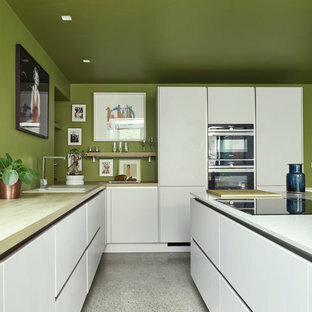 Design ideas for a mid-sized contemporary l-shaped kitchen in Dublin with white cabinets, wood benchtops, an island, white floor, a drop-in sink, flat-panel cabinets, green splashback, black appliances and terrazzo floors. 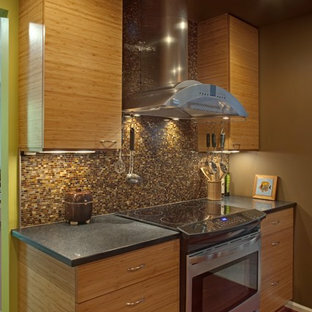 Contemporary kitchen in DC Metro with stainless steel appliances, flat-panel cabinets, medium wood cabinets, multi-coloured splashback and mosaic tile splashback. 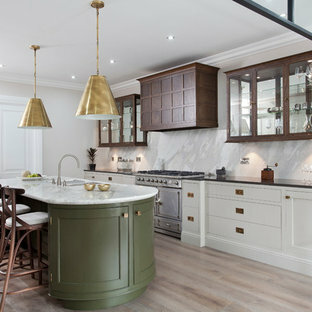 Photo of a transitional l-shaped kitchen in New York with flat-panel cabinets, white cabinets, metallic splashback and panelled appliances. 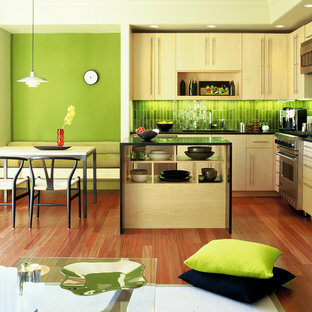 This is an example of a modern l-shaped eat-in kitchen in San Francisco with stainless steel appliances, an undermount sink, flat-panel cabinets, light wood cabinets and green splashback. 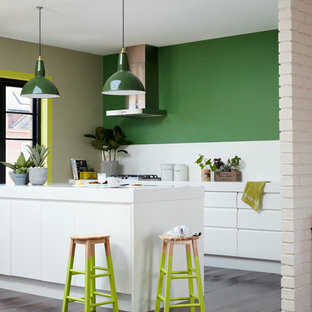 Inspiration for a contemporary kitchen in Buckinghamshire. This is an example of a traditional open plan kitchen in Oxfordshire with beige cabinets and panelled appliances. 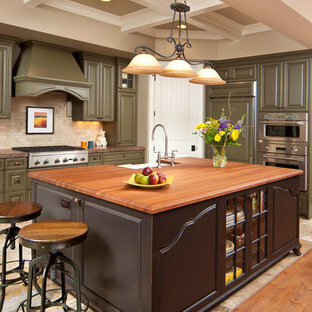 Inspiration for a traditional kitchen in Other. Built around the classic style of the Shaker design, Austin Olive and Mussel combines the rich, Mediterranean warmth of Olive with cool, distinctive Mussel. 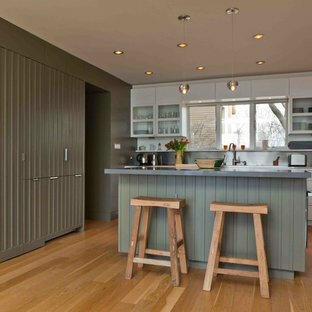 Clean, crisp lines and hand-painted timber sit at the heart of a vibrant and welcoming kitchen. This is an example of a country kitchen in Other.